Phones: The new models have faster processors, sharper cameras (12 megapixels), stronger frames, and a feature called 3D Touch, which allows easy access to frequent tasks by holding down on an icon. For instance, it'll be possible to update a Facebook status right from the home screen. 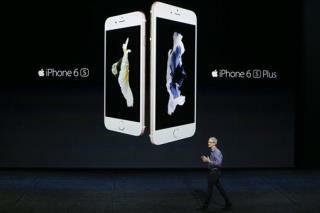 The iPhones will go on sale on Sept. 25, with advance orders starting Saturday. The iPhone 6S will start at $200 with a two-year service contract. The iPhone 6S Plus will start at $300 with a contract. The base models will come with 16 gigabytes of storage, but for $100 more, Apple is offering 64 gigabytes. For an extra $200, Apple is offering 128 gigabytes. Apple TV: Apple's set-top box is catching up with such rivals as Roku and Amazon's Fire TV with the ability to install apps on the device and to search for video with voice controls. A new remote has a Siri microphone button for voice commands such as "show me some comedies." The new device can search through shows and movies available on a range of apps including Netflix, Hulu, HBO, and Showtime. It will start at $149 and will be available in late October. The company will continue selling the existing model for $69. iPad: The new iPad Pro will take advantage of new multitasking features. A software update will enable iPads to run two apps side by side, something previously limited to Samsung and Windows tablets. The new iPad, out in November, will have a 12.9-inch screen, compared with 9.7 inches for the current full-size iPad. It will have four speakers and options for a physical keyboard and a stylus, called Apple Pencil. The starting price is $799, with 32 gigabytes of storage. The Apple Pencil stylus will cost $99, while the physical keyboard accessory will cost $169. Apple Watch: Apple says a software update for the Apple Watch will allow outside developers to write more sophisticated apps, ones that will interact directly with its sensors and controls. Single event? If it seems unusually busy for an Apple event, that's because the company is planning to skip the usual October event this year, reports 9to5 Mac. Apple is CRAPPLE. Never owned a cell phone; never will. Waste of money. Not so dependable, either. Apple makes some nice technology, I admit. I just wish that Apple users were more open minded. I have used Apple, Android, and Microsoft products. I have enjoyed products from multiple companies. Apple unveils less is going to cost you more again and $150 for an Apple TV? You are out of your freaking mind.